Update: The press release announcing Samsung's acquisition of Swedish company Fingerprint Cards AB has been revealed to be completely false. It's not clear how it happened nor who's behind it, but both Samsung and Fingerprint Cards AB have denied having anything to do with each other. Cision, the company that distributed the press release which was then published by Engadget, said, "At 10.30am a press release from Fingerprint Cards AB with the headline "Samsung Electronics to acquire Fingerprint Cards AB" was distributed by Cision. The press release was incorrect." In hindsight, that glowing quote from Samsung's CEO does seem a bit much, even taking translation into account. Samsung isn't being coy about its efforts to follow in the iPhone 5S's footsteps as it announces it's purchase of Fingerprint Cards AB, a Swedish company specialising in fingerprint scanning. The Korean company is spending $650 million (cash - the equivalent of around £400m / AU$680m) on the firm as it looks to boost its biometric security on its phones and tablets. "Swipe sensor technology is phenomenal in every way," said Samsung CEO Kwon Oh-hyun, definitely not heaping hyperbole on hyperbole as he added that it is "going to be loved by millions of people around the world." Fingerprint Cards AB specialises in using biometric sensors, processors, algorithms and modules to identify a person using their fingerprints. 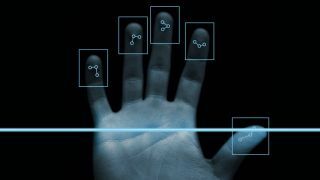 Its "world leading" fingerprint verification tech boasts low manufacturing costs and power consumption which makes it ideal for use in smartphones - like, say, the Samsung Galaxy S5 perhaps? The purchase seems to support reports in the Korea Herald that reckoned Samsung is "not yet developing the technology" for fingerprint scanning, although we'd suspect there's a modicum of internal research going on in this new smartphone hotbed. Samsung's existing swipe sensor team will work with the AB gang in a new Samsung division called "Samsung Fingerprint Cards Division"; lets hope we see the fruits of its labours soon.